The main challenge in writing a synopsis is squeezing the story into smaller size without losing its mystery so that an editor could read it in just a few minutes. Indeed, a short three- or four-page synopsis should tell the story from the beginning until the very end. It would be great if this synopsis could include irony, humor, emotional tension, and intrigue of the book. Synopsis is a perfect instrument for making the book more popular. In other words, it should make the reader want to read the initial manuscript. Step 1. Write a book. Indeed, it is the simplest and the most complicated step at the same time. If the book is not written yet, the paper you are writing is not a synopsis; it is an outline. In order to write a synopsis, you need to write a book from the beginning to the very end. So, for understanding the following steps better, let`s assume that the book is already written. Step2. Skip through the manuscript focusing on the most important events in every chapter. As the synopsis is not a lengthy assignment, try to squeeze the content of each chapter to only one-two sentences. I assure you that it is possible once you understand the main point of the chapter as well as its purpose. Surely, some chapters need more than just two sentences, especially the introductory, the climax, and the culmination one. In the introductory chapter, you need to tell about the characters, their specific feature, and their motivation. Do not forget to include the ending. 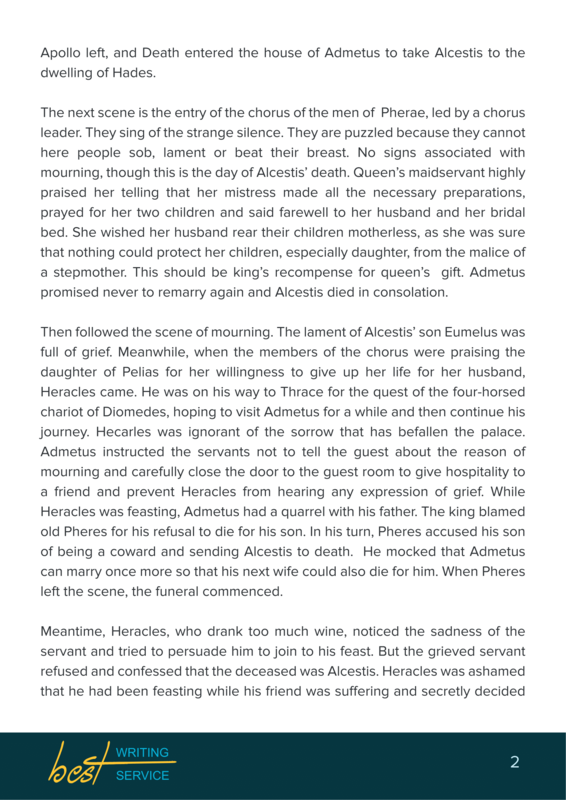 It is critically important when writing the synopsis since the ending makes the overall impression of the book. Step 3. Think carefully about the beginning of your synopsis. Keep in mind that even if you need to introduce your character, you cannot spend a whole page for that. Thus, you have to think carefully about the information that you want to include in your synopsis. In other words, the first part of your synopsis should include the information from the first chapter of your work. Who is your main character? Where does the story take place? What is the main problem discussed in the book? Step 4. Focus on the plot. When writing a synopsis on your book, you need to focus mainly on the plot and avoid lengthy descriptions. Remember that the essential purpose of any synopsis is telling the story. Do not include the meaningless details that do not refer to the plot since it will significantly reduce your chances for getting the desired outcome. Step 5. Tell more about your characters. Most books have the interesting characters, who make these books unique. If you want to intrigue your readers with your synopsis, you need to explain why your characters are worth attention. Indicate the moments or episodes that influence your characters mentally. Does your character learn something throughout the story? Does he/she change the beliefs and attitudes? Do not hesitate to show the growth or destruction of your character. Step 6. Edit your synopsis. If the synopsis you provide is full of typos, misspelled words, or grammatical mistakes, you will never get the desired result. You are a writer and you do not have the right for such a mistake. A little secret: have some rest before proofreading your synopsis. We assure you that it will help you look at your paper with fresh eyes. 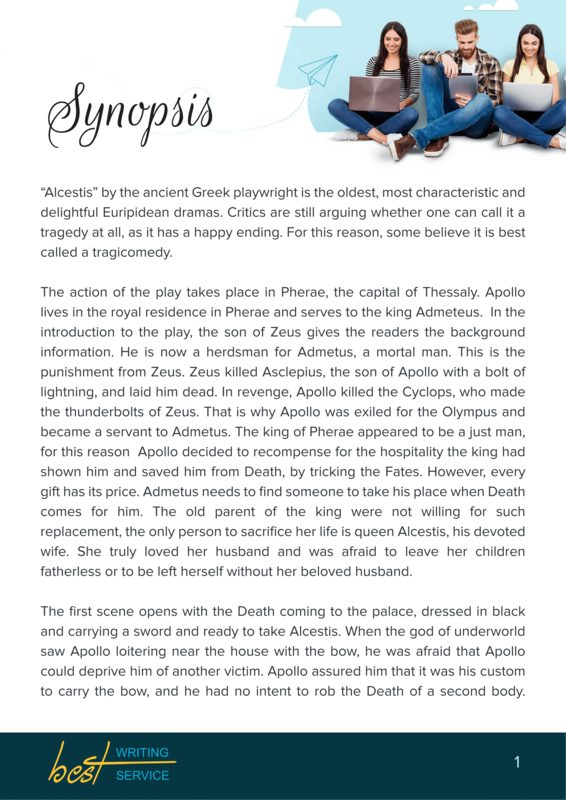 There are many synopsis templates available online. You can download some of them and learn a few tips and secrets of successful synopsis writing. Undoubtedly, having a good example of a synopsis, you will be able to create a truly professional piece. This information might also be useful: "Academic Book Review: How to Complete It"
If you are a student, who needs to write a synopsis, you have not so many options. First, you can spend much time and efforts, and write a synopsis totally neglecting your personal life. Alternatively, you can agree with the academic failure and submit a synopsis if a rather low quality. However, there is one option that is favored by the smart students. This option allows them to submit the great paper, get the highest grade without compromising the hobbies and relationships. Cooperation with Best-Writing-Service.org has already enabled many students to improve their academic performance and save their reputation. Of course, when ordering a paper online, you want to learn more about your potential writing partner. If you want to understand the level of proficiency of the writers working here, you can just visit our testimonials page and read the feedbacks left by our customers. Almost all of them were totally satisfied with the cooperation with Best-Writing-Service.org because we demonstrate a customer-oriented approach in every order. Need to buy a synopsis? No problem! Just let our support representatives know about it and they will help you place the order. When ordering some assignment at Best-Writing-Service.org, we encourage you to upload all the necessary instructions and files from the very beginning. Our writers treat synopsis writing as a creative task and they apply a creative approach to every order. Unlike other companies, we create only authentic papers, which means that every synopsis ordered at Best-Writing-Service.org will be written totally from scratch in accordance with your specific requirements. The specialist will read your instructions carefully in order to understand your guidelines. Then, he/she will start working on it. Due to our professional approach to work, your synopsis will contain fresh ideas and creative thoughts. Also, it will meet the highest academic standards. We guarantee that all your “write a synopsis of my novel” requests will be treated with the highest level of dedication since we highly value all our customers, no matter you order a paper for the first time or you are our returning client. Placing your order here, you do not have to worry about your privacy since we will keep our cooperation completely anonymous. Rely on us and we will show you that we can be your true friend in the world of academic writing. All in all, we take a special place among other synopsis writing services due to the variety of attractive services and affordable prices. You may find this interesting: "How to Find a Proper Format for an Essay"